A ride/run/race isn't worth mentioning if everything goes perfectly. Two weeks ago I did two gravel metric centuries, but everything went well, so that's that. Yesterday though was a different story. 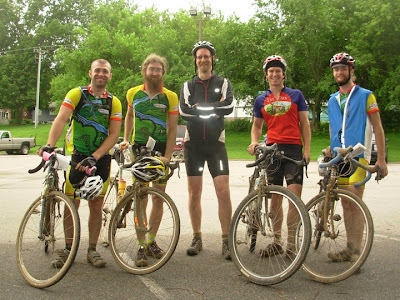 A group of us from Skunk River Cycles went down to Newton for the Renegade Gravel Race. It was originally supposed to be a team race with five person teams, but due to popular demand a solo division was created. As a consequence only two teams showed us and one other and the other didn't have five members, only four. I think that counts as some sort of moral victory on our part. The weather forecast played a part in the low turnout too. 60% chance of thunderstorms. Well, we didn't get the thunder, but we got plenty of rain. We hadn't had much experience working as a team and so we couldn't take advantage of team tactics (drafting mostly) as much as we would have liked. After the field thinned out we were able to make a paceline for 15-20 miles, but due to differences in skill and strength it was tough to hold it together. After the checkpoint in Kellog we mostly didn't bother. It rained pretty steadily for most of the race, but we had a good group of people and there wasn't any complaining. I flatted about 45 miles in and told the rest of the team to go on. Fixing a flat in the rain was about as fun as you'd expect, but really not that big a deal. I did have trouble locating the cause of the flat and that bothered me, for several miles afterward I was constantly checking to make sure I wasn't losing pressure. I caught up to the team a few miles later as they contemplated the B road. The roads were just fine, at least until we got to that one B road on the course. There was some discussion about killer B roads and my destroyed derailleur problems of earlier this year. We opted to be (B? bee? )cautious and walk if anything looked sketchy. It looked pretty sketchy. We weren't cautious enough. Less than 100 yards into the road Stephen's rear derailleur self-destructed. Well, I'd been through that before and luckily it was another Surly Cross Check so we had the option to single-speed. It took me longer than I would have liked to single-speed it, and we were on our way, walking. Only later would we realize that this was the very same B road that destroyed my hopes at this year's Trans-Iowa. It looks different in the light, but it might still be evil. Once we managed to push/pull/carry our bikes down a mile of sticky Iowa clay we cleaned our bikes and got back on. We had to stop a few times to adjust the chainline and gear on the kludged single-speed, but eventually we found a gear that worked and Stephen was able to finish the race. We rolled up to the finish in last place, but we made it. Working with a team is certainly a different dynamic. With a little practice and one fewer wet B road we could do pretty well. "A ride/run/race isn't worth mentioning if everything goes perfectly" Now that's interesting. I found my last few rides, extremely pleasurable to ride, but totally boring in a sense to write anything about them, because nothing happened but pedal rotation. Good to hear you out there chewing up the mud. Getting the X-Wing out of the swamp.